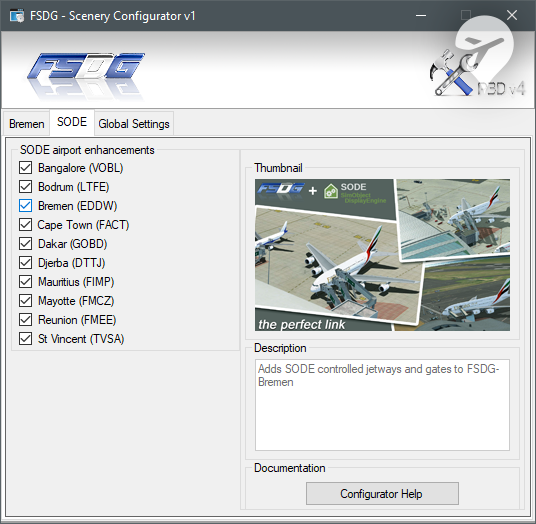 Installing Bremen was straightforward and as you’d expect with any FSDG product. My name and a serial number were all that was required to set it up. Here’s where things get jarring. To begin, I had trouble locating the scenery configurator as it was not added to the start menu. 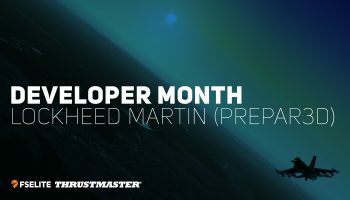 I had to root through the Prepar3D addon folder to find it and then add it manually to my start menu which was quite a nuisance. Similarly, for the documentation, it would be nice to have it under a folder in the Start menu to easily find it – or at the very least, have a dedicated button within the configurator to open it up. 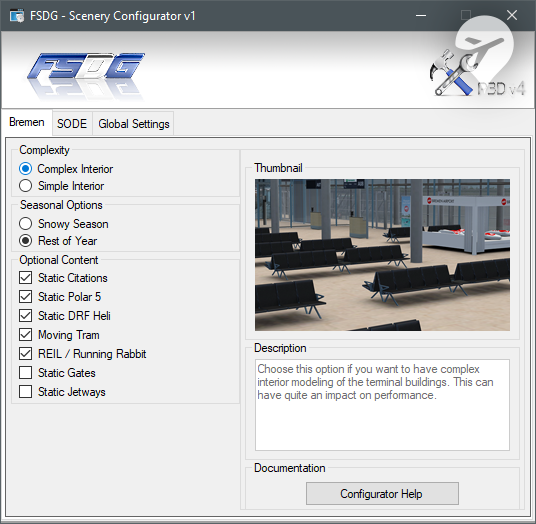 The global FSDG configurator is an imperative tool. 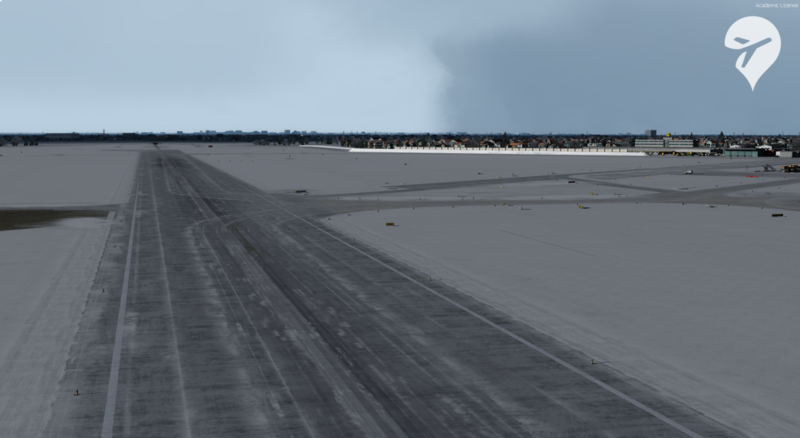 It enables me to toggle between seasons (including a hard winter), static aircraft, SODE jetways and terminal interior complexity which is the only major performance-related option. I favour having all options enabled and the terminal interior complexity set to high. 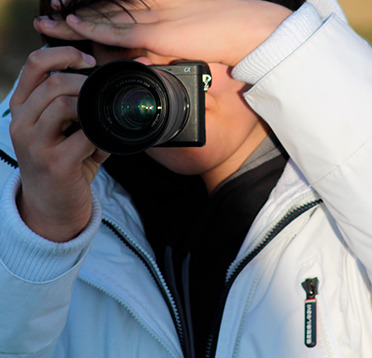 The documentation is adequate, packed with all of the information you’ll be needing. 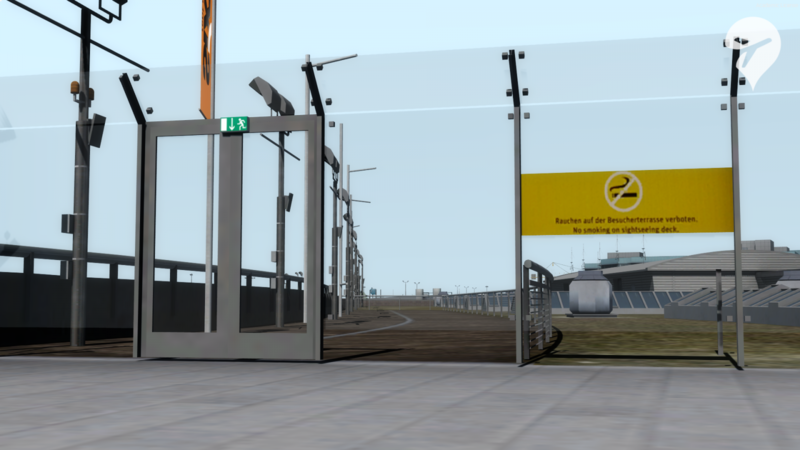 For example, in the documentation, you can find information on changing seasons, as well as installing SODE jetways the inconvenient way. SODE does not come preinstalled with the scenery. 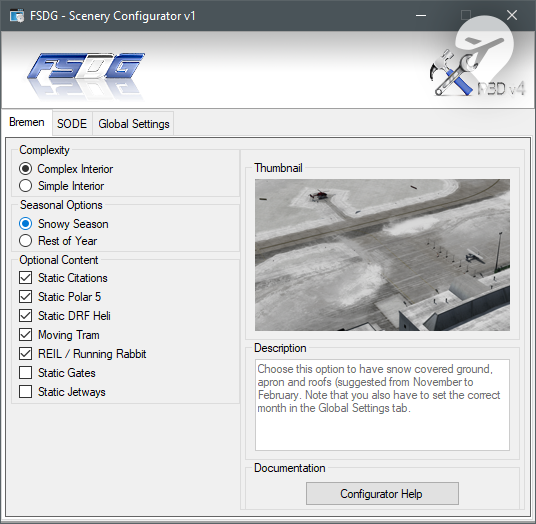 I had to download another installer package which globally installs SODE automatically at least, for all FSDG sceneries which I deem quite inefficient in the long run. Updating this product could also use some work. I had to perform a clean uninstall and reinstall in order to get it to the latest version. 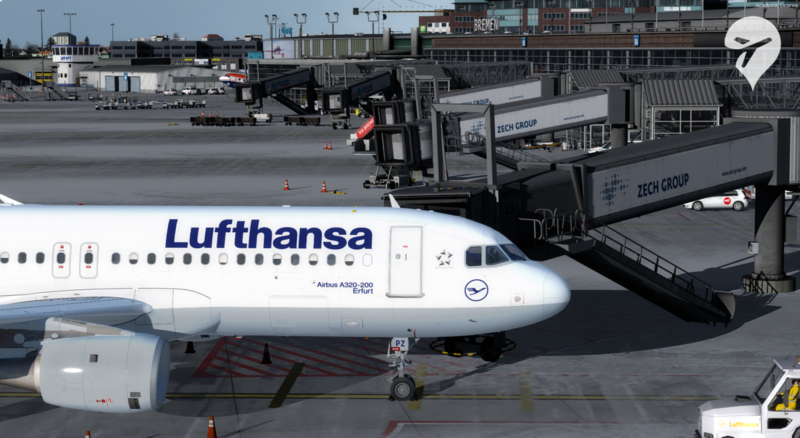 I ran into an issue with SODE jetways being misaligned with the updated version, nothing indicated that I had to download the latest version of the SODE jetways which in the end did fix my issue. But still, this brings me back to my first point regarding SODE installation: it is entirely inefficient and quite frankly irritating. 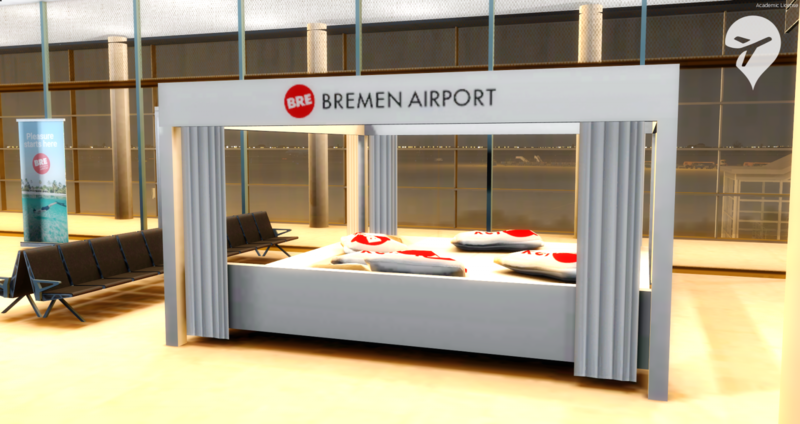 After a bumpy start, let’s take a look at the package features Bremen has to offer. 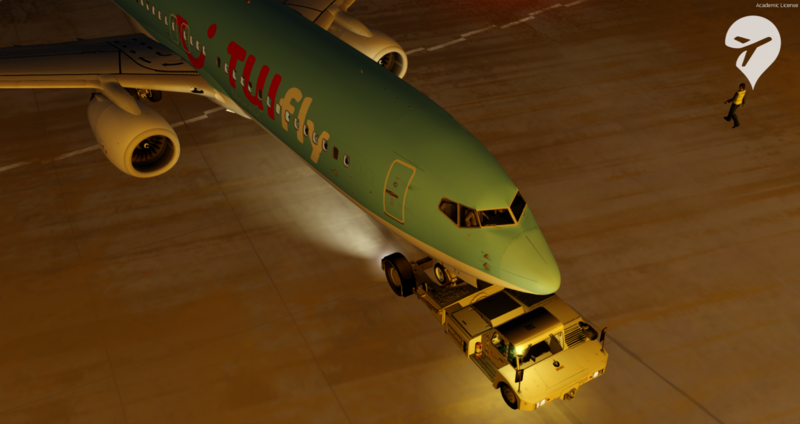 Initially loading in, the first thing I notice when glaring out of my cockpit windows is how alive the airport feels. 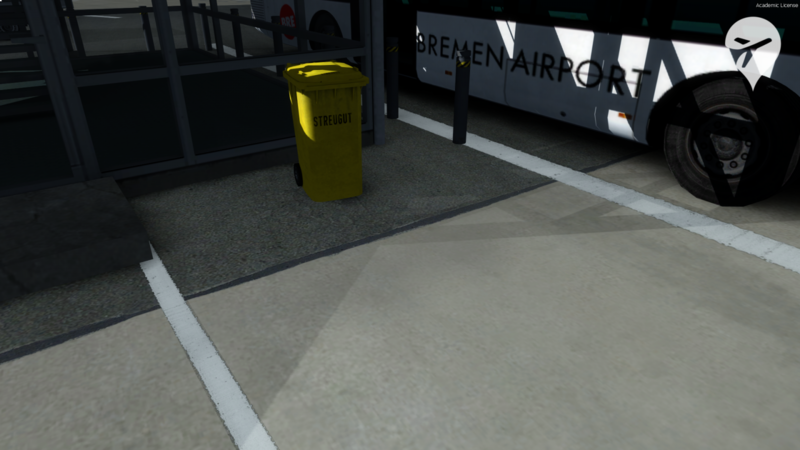 Being greeted by objects such as bins, fire extinguishers, general airport operations equipment, moving cars, and airport vehicles & busses painted in liveries you’d see at the real airport brings so much life to the setting. However, during nighttime and the snowy season, the moving vehicles have a disgruntling texture that trails along with them at ground level, I can only assume this is a bug. Looking at the ground layout, I perceive that FSDG made an incredible effort at replicating the authentic layout, markings, imperfections, sewers/grates and prevailing dirt as a result of daily operations. Upon further examination, I notice that the ground lines have a slightly uneven/jagged edge as you’d see in the real world. 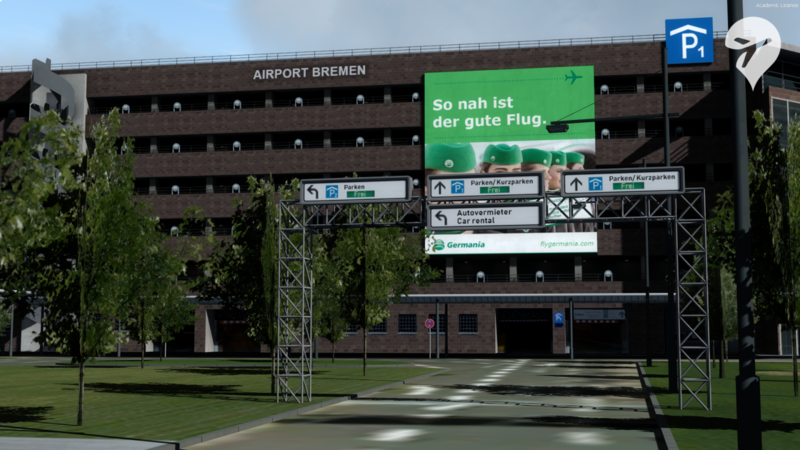 The surroundings encompassing the main terminal airside are abundant in insignias, Plastered in, signs and car rental ads which would go amiss on first glance. With that, I get a somewhat plain glimpse into the detailed interior with glass that features a light stroke of weathering. The terminal interior, however basic, is shockingly detailed for what it is. 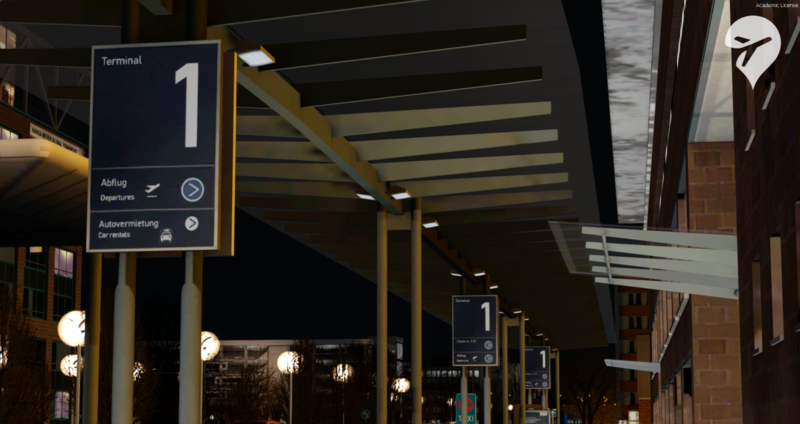 It’s coated with real-world advertisements and contains objects such as ceiling lights, boarding gates and seats adding quite a lot of immersion. 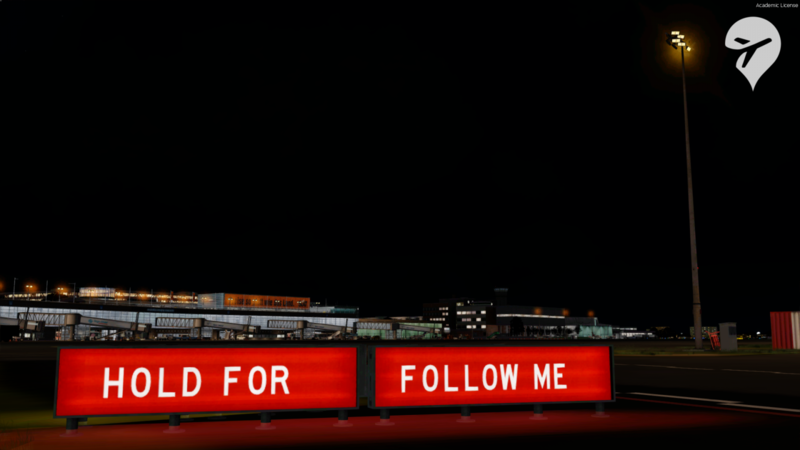 Provided as an option in the configurator, there are some unique static aircraft placed around the airport. 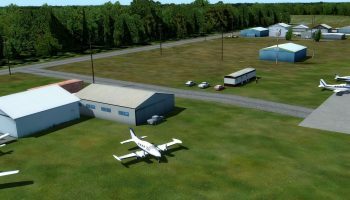 These include the Polar 5 BT67 at the AWI hangar to the left of the terminal and the static Lufthansa Aviation Training Citation jets to the right at the training hangar. Both bring some extra excitement to the scenery with no impact on overall performance. 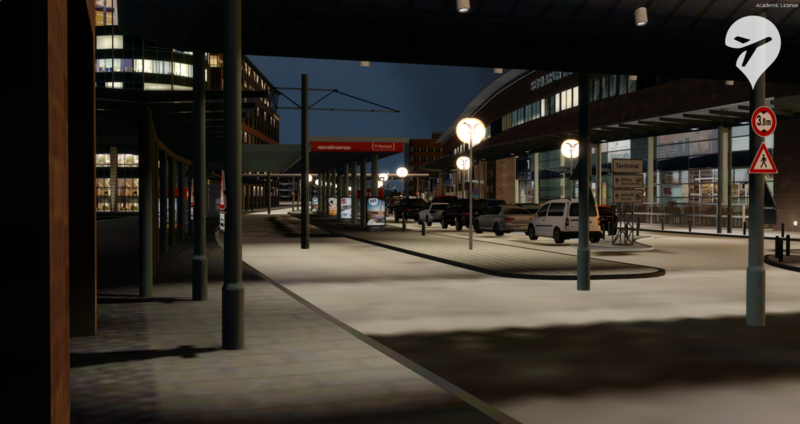 Moving over to the landside, I’m elegantly surprised with the presence of a moving tram, parked cars, real-world signage and more authentic advertisements plastered about. 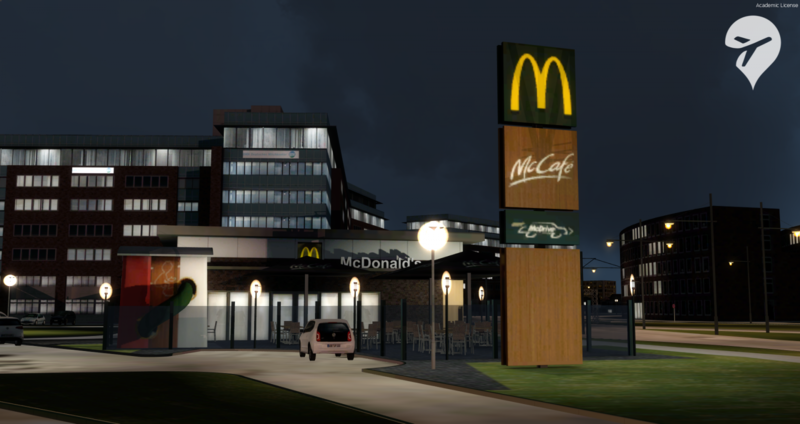 Moving north up the street, there are more wonderments to be found, such as a super-accurate rendition of the McDonalds adjacent to the terminal which, note, is no joke, having the seats modelled and textured in shocking detail outside of the establishment. It all makes me think ‘wow, they actually bothered?’ – in a good way, of course. 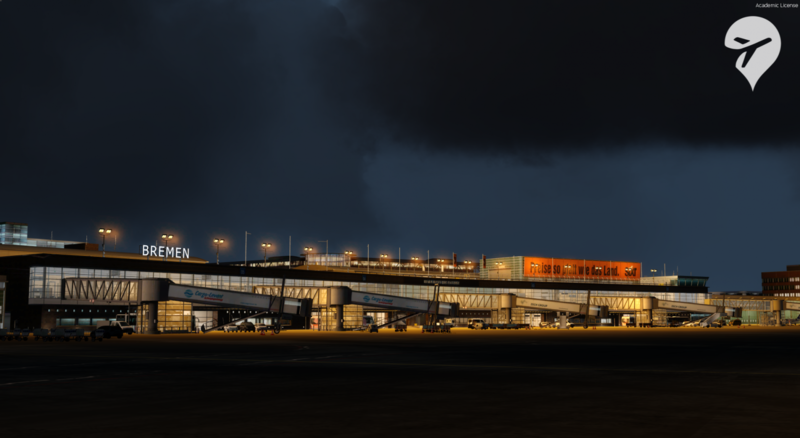 Needless to say, there is a severe amount of detail as mentioned above put into the small area surrounding the airport making it look appealing day, night, sun, rain or snow. Another contemporary option found in the configurator is ‘Snow Season’. 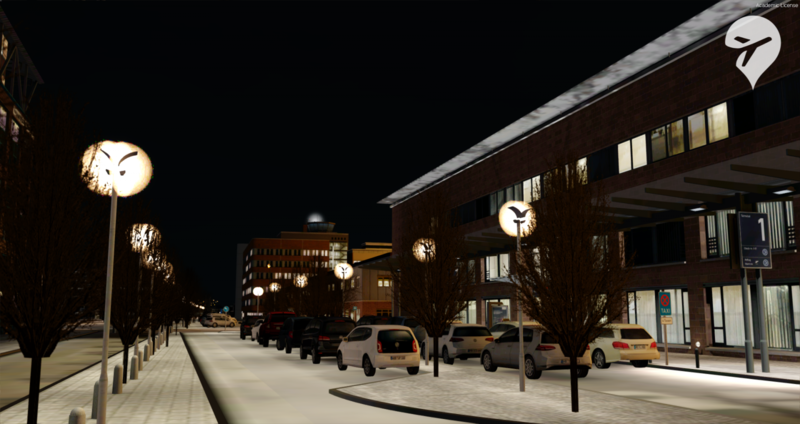 When enabled, it completely transforms Bremen into a winter wonderland. And when I say completely, I mean that; roofs, taxiways, objects, cars and virtually everything I can see are covered in a layer of snow. It truly is a gorgeous sight which completely changes the environment. Though it’s almost good all round, one thing I’ve noticed is that all custom trees which were present before are no longer there when using the snowy textures, unfortunately, making landside look quite a bit more dull and empty. 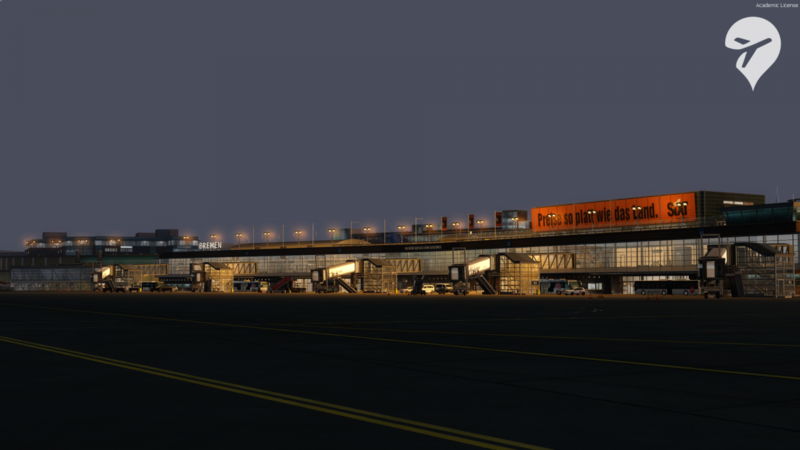 Moving on to the feature I most relish, the terminal’s night lighting and textures. This airport looks considerably better than some others I’ve seen around the same price point. 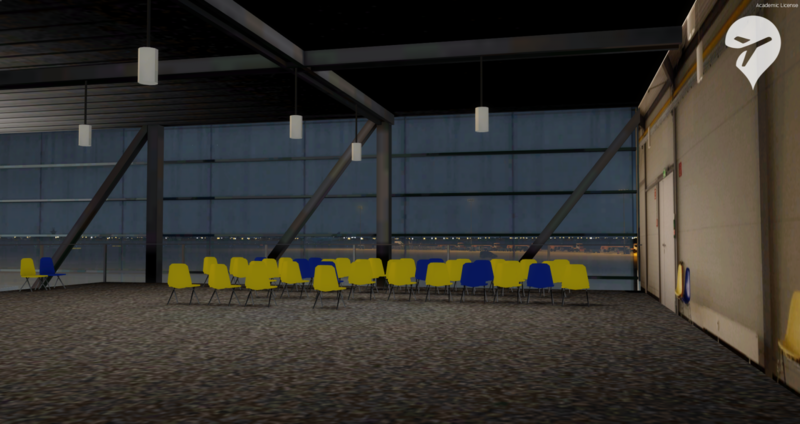 Especially when it comes to the colour accuracy of the dynamic lighting and textures surrounding the terminal. 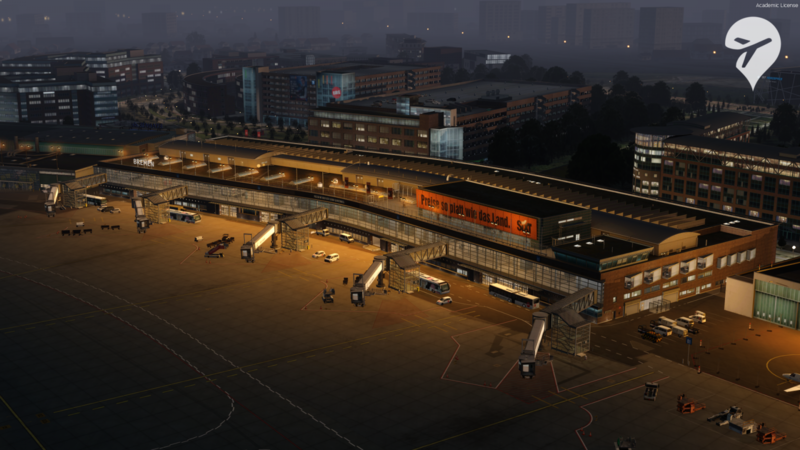 I found that it is rather strong or daunting at first, but once compared to pictures of the actual airport in the night, I came to appreciate that there was quite some thought put into making this airport resemble its real-world counterpart as much as possible. 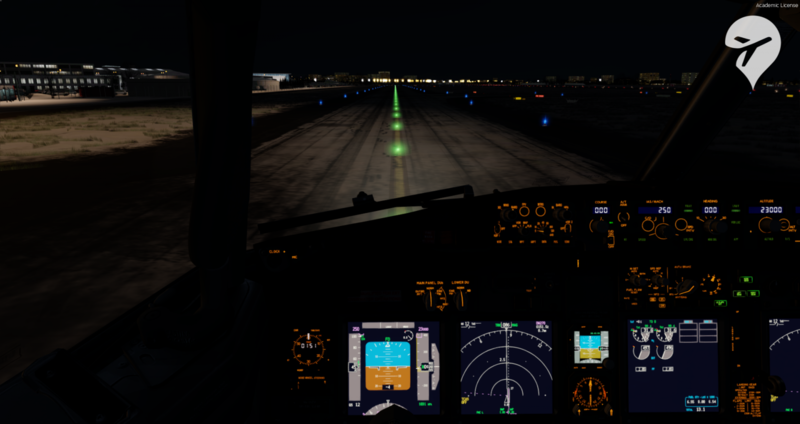 Runway and taxiway lighting is completely acceptable except for the fact that when I don’t face them head on but from the side, I notice that they’re just 2D lights and they don’t look as good anymore. I understand other addons also follow this method, however, I find it to be too blatantly obvious in this case. 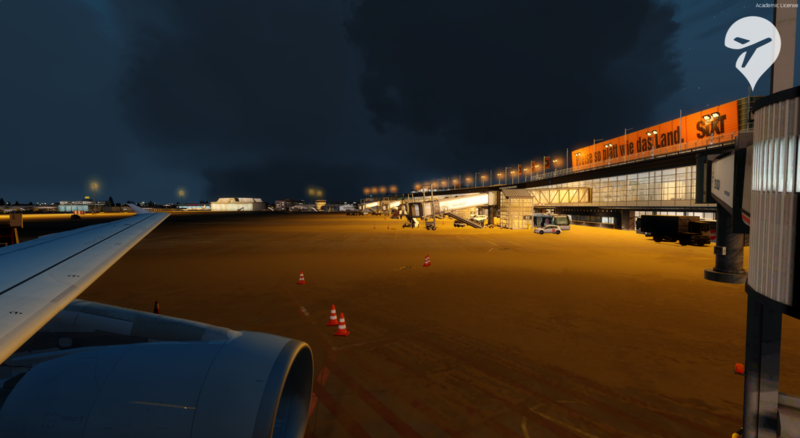 Being a Prepar3D v4 exclusive, I had expectations for this airport to make use of some of the newfangled effects Prepar3D v4 has allowed developers to create, such as dynamic weather effects and snow pileups for the winter season setting. 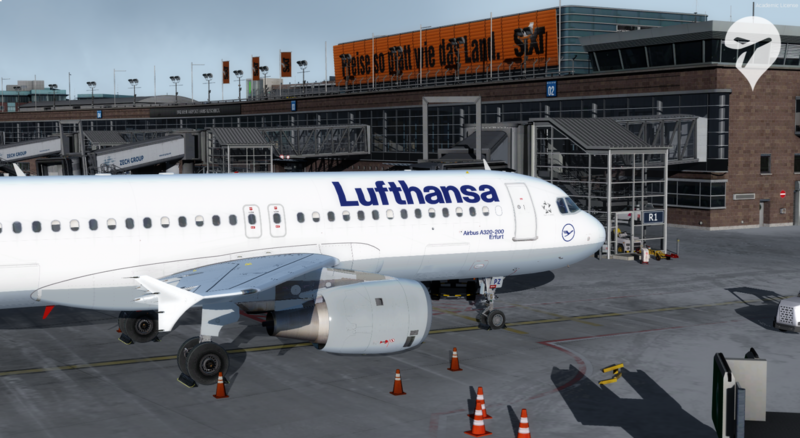 I don’t see it as a major drawback, however, seeing such features become more prominent in recent v4 releases makes me want to have it at Bremen. Before I begin, I have TomatoShade with dynamic reflections enabled at medium. 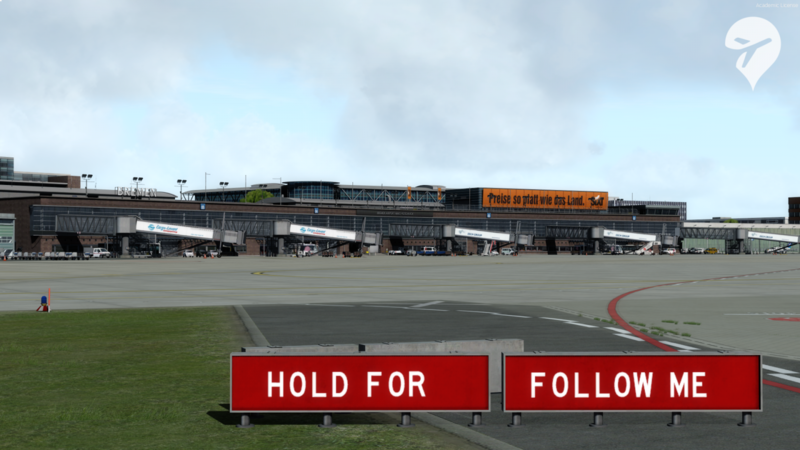 I run quite a modern system with no overclocks capable of handling major airports such as Aerosoft’s Cologne (EDDK) at 30-40 FPS on a flight with the NGX without a hitch. 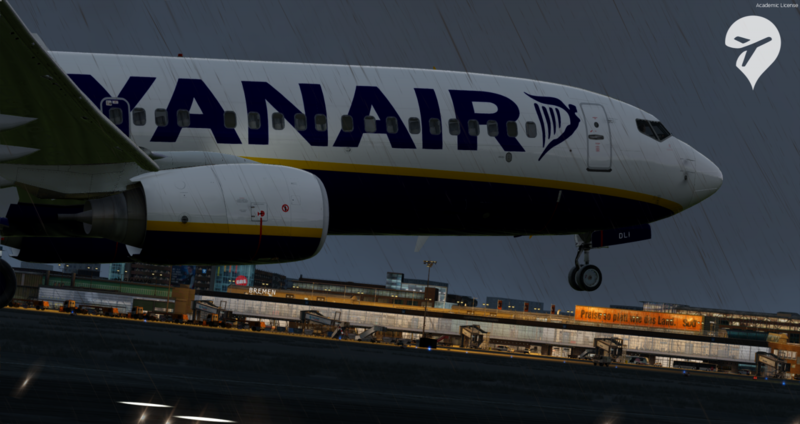 Loading into the scenery after configuring my scenario with a default aircraft and no weather took just 31 seconds in comparison to Prepar3D taking 27 seconds to completely load the default Bremen which I believe is a quite negligible difference. 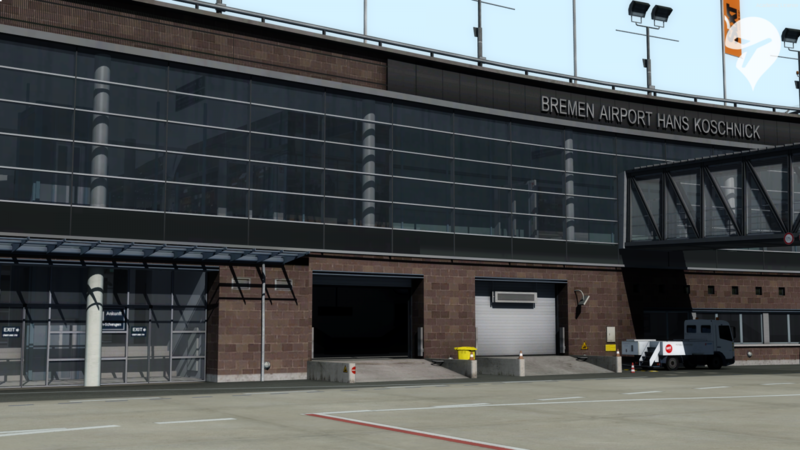 Even with the complex interior option checked, Bremen is no exception when it comes to good performance. 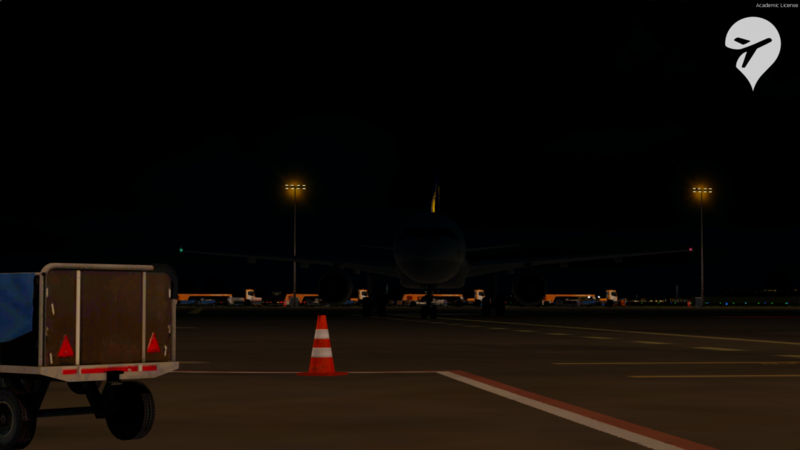 Performing spectacularly at night with dynamic lighting blasting at 40 FPS, and during the day with the airport buzzing in traffic from UTL, I find that I can achieve a solid mark of 60 FPS with the occasional stutter here and there. 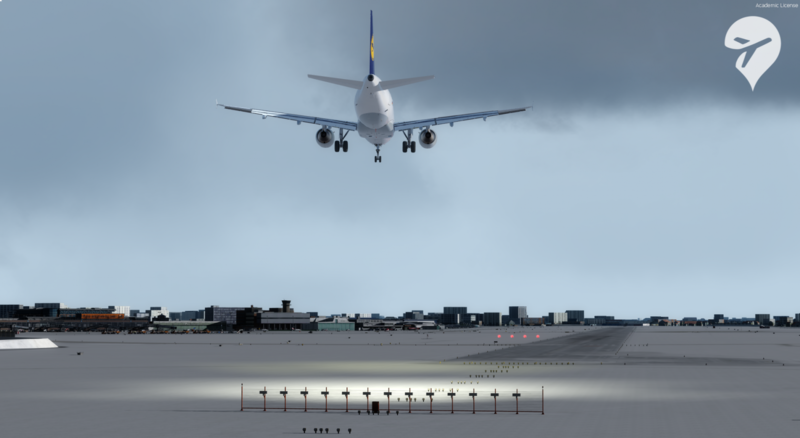 Using aircraft heavy on performance, such as the FSLabs A320/19, can have your FPS going down to 25 when taxiing or landing. This is to be expected, but otherwise, 30 FPS is very much achievable when using such heavy addon if you’ve got a capable system. 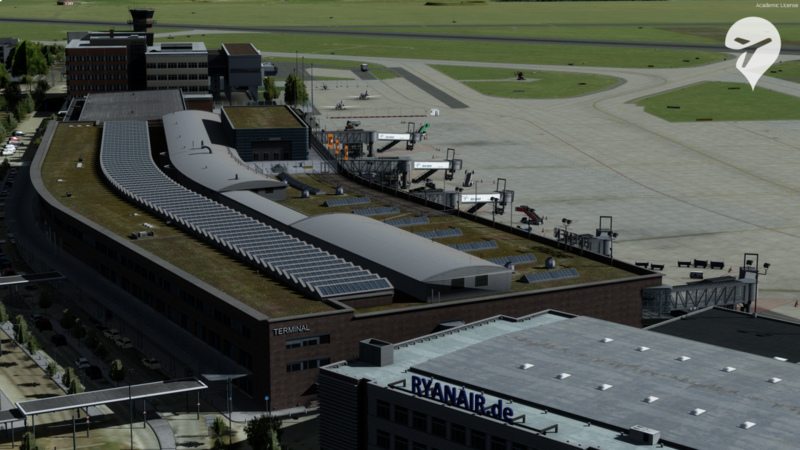 For €21.00 which I find to be a mid-high range price point, you get a sumptuous North-West German airport with a botched installation, update and SODE fitting procedure. Configurator options such as being able to adjust interior complexity, seasonal changes and a small range of optional content do crush the wall when it comes to giving you a little bit more bang for your buck. 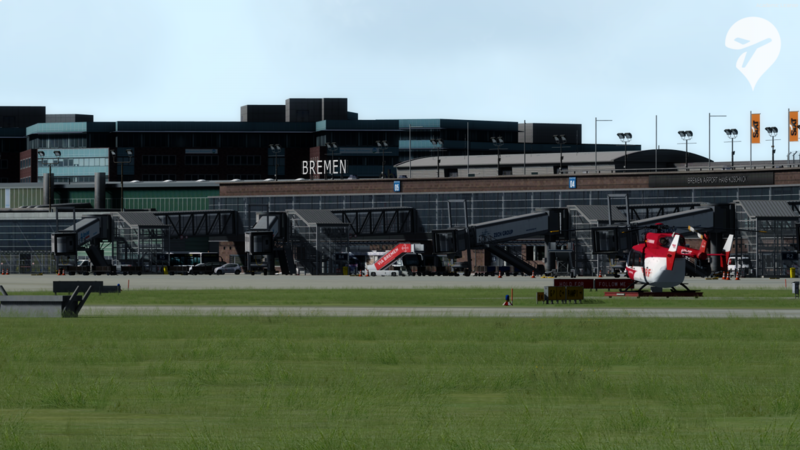 As I’ve overly mentioned, there are many alterations to be made more in the overall user experience rather than the scenery itself and that is where Bremen falls down compared to other products from mainstream developers. Whilst maybe minor, I’d like to see them made before I could justify its price tag. Asides from all of the above-said negatives, FSDG breaking the €20 barrier with Bremen is at the very edge of falling away from justification being saved by its unsullied, up-to-date visuals and distinct performance. 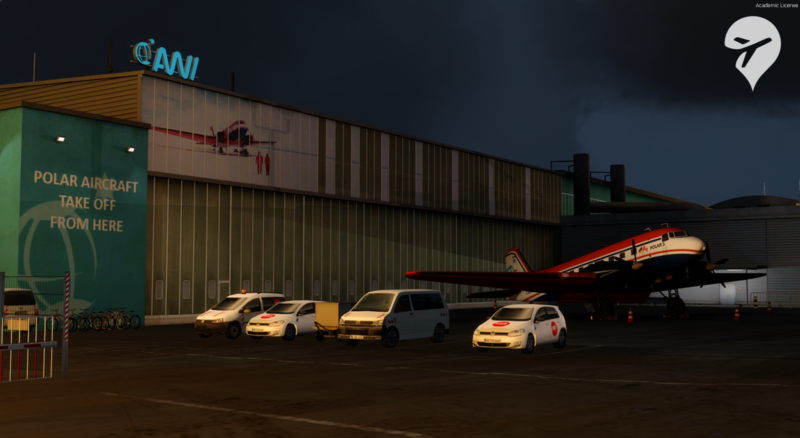 To date, I assert that I find this to be Flight Sim Development Group’s most majestic and cost-effective scenery addon amongst others such as Cape Town and La Romana. Calling the aforementioned a rock-solid release would be questionable. I’d like to see alterations made to the user experience and realised at some stage before I could say so. 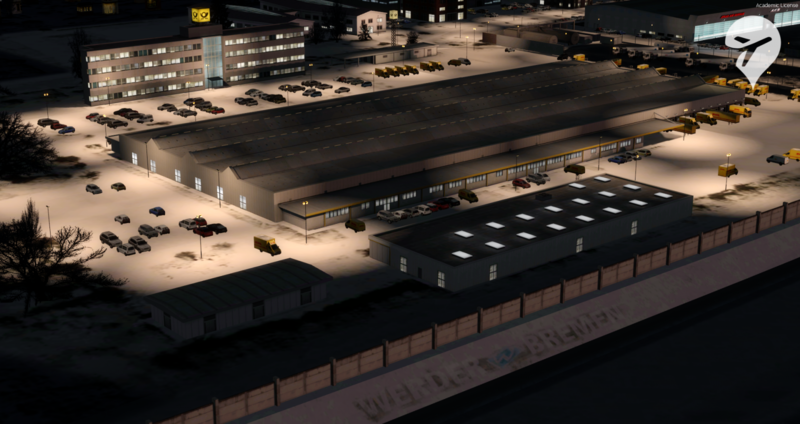 Again, night lighting is almost perfect recreating the setting accurately in-sim airside or landside. 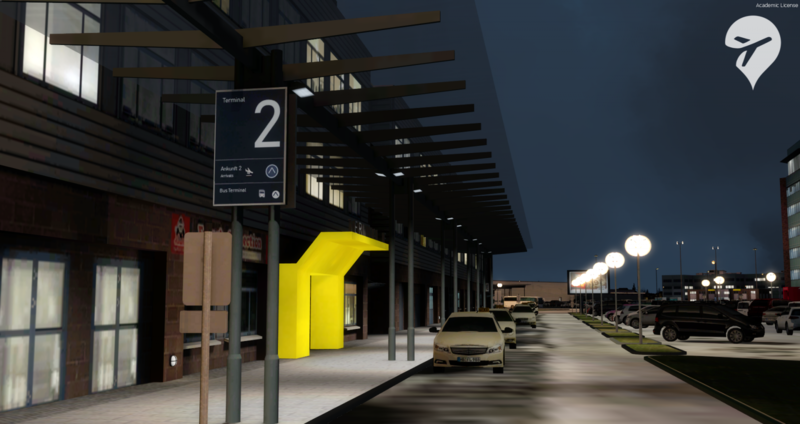 The surrounding area could almost be considered too detailed alongside the terminal interior, which is not a drawback in the slightest as performance is able to keep up with adequate optimisations made. 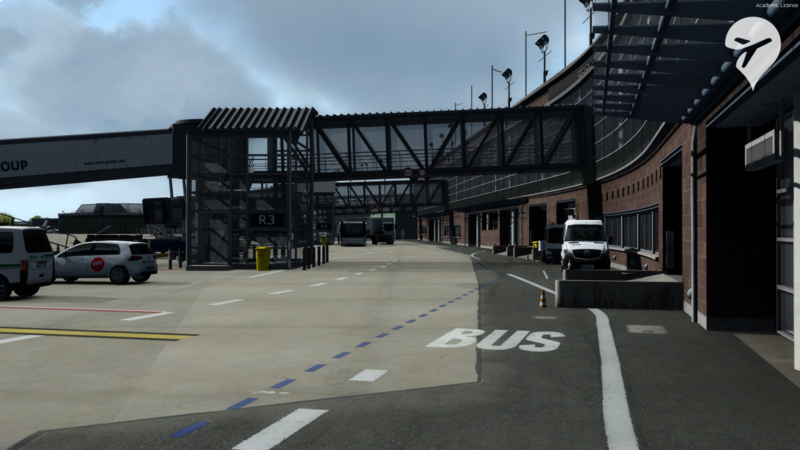 Airside is no exception, with functioning SODE jetways and humble little details and insignias left, right and centre which would go amiss on first glance all work together to bump up the immersion factor. 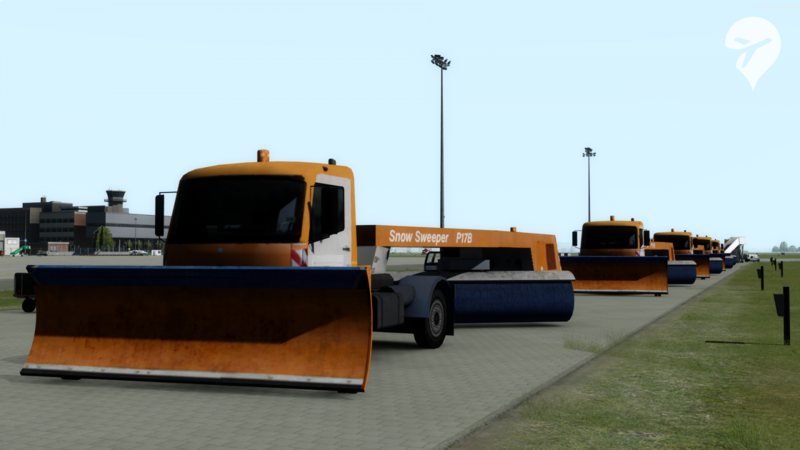 This addon takes the stage away when it comes to seasonal changes, particularly with its hard winter option. Would I recommend this airport? Yes, absolutely. 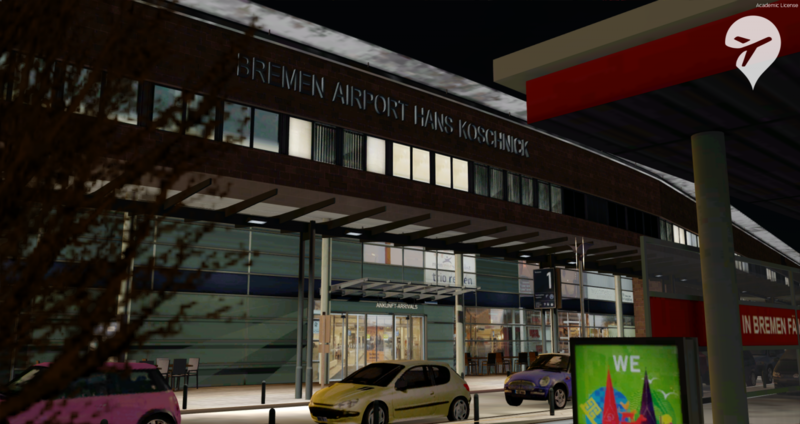 If you’re looking for a break from mainstream city airports or are looking to expand your route network, Bremen might just be for you. With a botched update and installation procedure, coupled with unsullied contemporary visuals and great performance, my thoughts and feelings towards this airport are quite mixed. 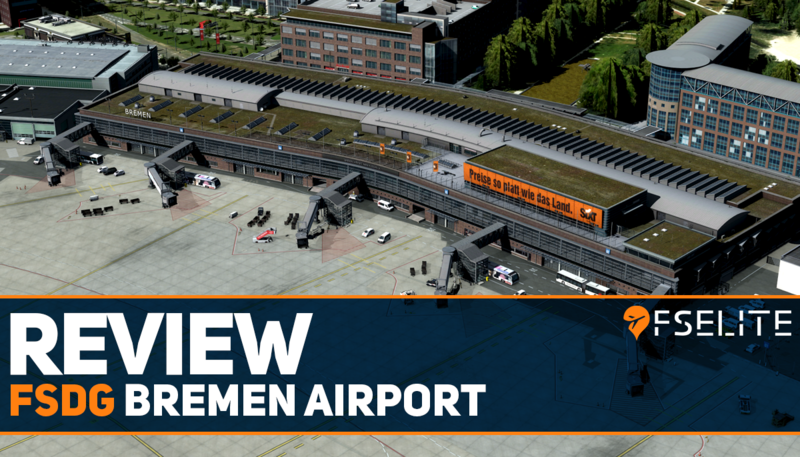 Coming in at a moderate cost to visuals ratio, it is needless to say that I can recommend this airport for anyone looking for a break from mainstream city airports or major hubs. 7.9 Out of 10 How do we score? | Feedback?